20-20 Voice Cancer > Cancer Factfile > Awareness – Much More Is Needed! This very important for all larys for if you are stranded somewhere and need help you need to be logged on with this mob for they will know you a laryngectomee logged with their service: https://www.ngts.org.uk/how-to…/contact-999-using-ngt.html. Register with them and your worries about being stranded will be over. Happiness prevails. Please Note: This is worldwide information I found, copied and pasted on a site named uptodate.com. …..Worldwide, head and neck cancer accounts for more than 550,000 cases and 380,000 deaths annually. …..In the United States, head and neck cancer accounts for 3 percent of malignancies, with approximately 63,000 Americans developing head and neck cancer annually and 13,000 dying from the disease. …..In Europe, there were approximately 250,000 cases (estimated 4 percent of the cancer incidence) and 63,500 deaths in 2012. …..Males are affected significantly more than females with a ratio ranging from 2:1 to 4:1. The incidence rate in males exceeds 20 per 100,000 in regions of France, Hong Kong, the Indian subcontinent, central and eastern Europe, Spain, Italy, Brazil, and among African Americans in the United States. …..Mouth and tongue cancers are more common in the Indian subcontinent; nasopharyngeal cancer is more common in Hong Kong; and pharyngeal and/or laryngeal cancers are more common in other populations; these factors contribute disproportionately to the overall cancer burden in these Asian countries. …..The incidence of laryngeal cancer, but not oral cavity and pharyngeal cancer, is approximately 50 percent higher in African American men. The mortality associated with both laryngeal and oropharyngeal cancer is significantly higher in African American men, which may reflect the lower prevalence of human papiloma virus (HPV) positivity. …..In 2016/2017, the “20-20 Voice” Cancer charity carried out an in depth survey, world wide regarding the start to finish process of self concerns, Dr visits, diagnosis & treatment: you may find the results very interesting in light of the above which has now become available! 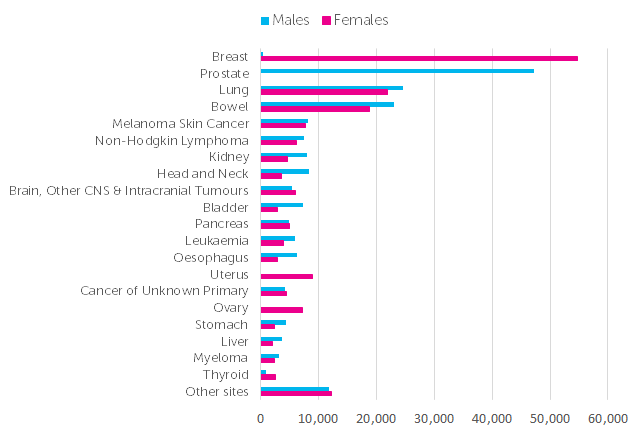 Below is a graph analyses (courtesy of CRUK) of all the ‘common’ cancers. You will see that head & Neck cancers sit at 8th in’popularity’ but they do not get 1/8th of the advertising/awareness that other cancers do-why is that? The answer is very simple, these types of cancer just don’t bring the money in the door like Lung Cancer, Breast Cancer, Prostate Cancer or Bowel Cancer – which everyone seems to relate to. But try living with no voice! This charity is now getting itself in position to bring diagnostics forward by as much as 15 months – a lifetime to a cancer sufferer I might add!